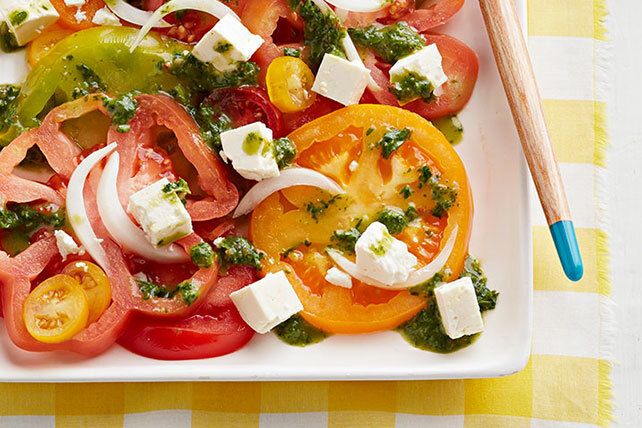 Showcase your heirloom tomatoes in a tasty Heirloom Tomato-Feta Salad! Our tomato-feta salad is made with Vidalia onions, feta and aromatic fresh herbs. Arrange tomatoes, onions and cheese on platter. Blend remaining ingredients in blender until smooth; drizzle over vegetables and cheese. Heirloom tomatoes come in all sizes, shapes and colors. For best results, use a variety of different colored and shaped tomatoes when preparing this seasonal salad.